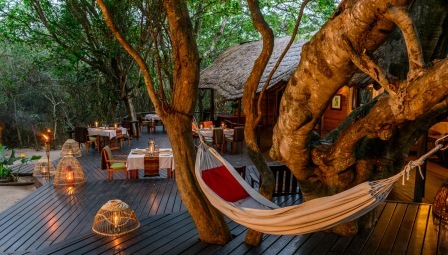 Secluded in a sand forest on the banks of a placid lake, Kosi Forest Lodge is the only private lodge in the Kosi Bay Nature Reserve – a treasured part of the Isimangaliso Wetland Park. Enjoy canoe and boat trips on the lakes, walks through raffia forests, and day trips to breathtaking coastal beaches. Eight thatch and canvas cabins are set in the forest, and have romantic open-air bathrooms. 3rd NIGHT FREE SPECIAL OFFER 2018 / 2019: Stay for 3 nights and the last is free, inclusive of all meals and guided activities. Subject to availability and valid for travel in May and June in 2018 and 2019. This venue does not offer formal conference facilities, but informal meetings can be hosted for a maximum of 16 people.